Discussion in 'Busse Combat Knives' started by Micro-Bevel, Sep 10, 2010. There's like ten parts to this..... Id like a kdsh please. Does anyone know what knife that is on the top row, eleventh one from the right? Silver with brown handles? Thats a Bushwacker Mistress with competition finish. First 2 links are now "page not found"
Noss did not move over all the videos he made so some are not on the web yet. Well done!! Way to get it started love the tunes to! My ASHBM feathering white Poplar and curling a single feather over 30 times. Taken from older footage of "one year later" testing I did on the edge retention of INFI. This is the factory edge after about 14 months of on and off use. Factory edge, never sharpened in any way. Original audio was lost, sorry about that. Here is a historically significant review by an existing forum member done in 2000 showing INFI's superiority has been going for a very long time. I had the good fortune to spend this past weekend hiking and fishing with my brother and a friend in the backcountry of the Sequoia Nat'l Forest. For those familiar with the area, we fished a stretch of Boulder Creek about 30 miles west of Mt. Whitney and 10 miles south of Kennedy Pass. Having only recently received my Busse Steel Heart II variant from Andy Prisco, I was eager to take this opportunity to give it a proper indoctrination. To better assess its versatility, I purposely took no other knives and relied on the SHII to perform all tasks both in camp and on the trail. This, of course, isn't how I normally operate, but this was intended to be a test after all. For the record, the edge on blade had not been touched by me since its arrival from Andy Prisco. After a late arrival Friday night we arose early Saturday morning to sub-freezing temperatures, grabbed our packs and poles and headed down the steep slopes toward Boulder Creek. Being the only knifenut amongst us, I made sure the SHII was securely strapped to my gear before our departure. As it turned out, my not so little companion would see use early and often. About an hour outside of camp we came across a small, but key, foot bridge that evidently didn't survive last winter. During this period of high runoff and fast water, this particular bridge provides the only means of access to the fishable portions of Boulder Creek. After scouting up and down this feeder creek for about 30 minutes, we were faced with only one barely acceptable alternate crossing. This route, however, was blocked at the crucial stepping off point by a couple of dried out, gnarled scrub oak branches about the diameter of a grapefruit. Having no desire to add whitewater rafting to the list of the day's activities (especially sans raft), out came the SHII. After about 15 minutes of steady chopping the way was cleared. Fortunately we were able to avoid what would have otherwise been a quick end to our hopes of fishing that day. Despite the extremely hard nature of the wood in question, the handle remained comfortable throughout. I believe that the knife's slightly blade heavy balance was a definite advantage here, as well. At the end of this chore, there was no perceptible difference to the feel of the edge. Several hours later the canyon narrowed, and our only path was blocked by a thick briar patch that gave new meaning to the term "dense vegetation". As some promising pools were just ahead, the decision was made to call the SHII back into action. The going was a bit slower here, but again, the knife performed admirably. Most of these branches were about the diameter of your typical garden hose, and although they were alive, they were still very dense and dry. 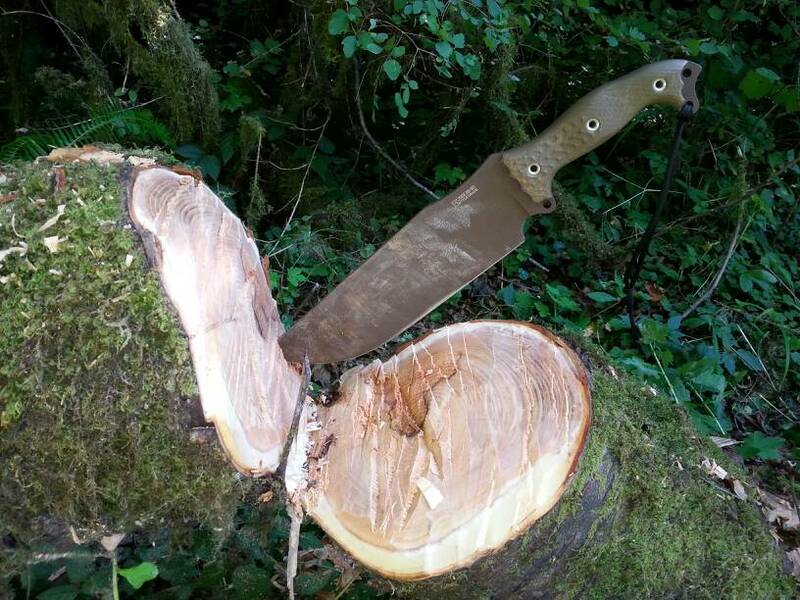 These thorny shrubs were also very springy and the relatively narrow edge profile of the SHII (as compared to most other heavy duty utility blades) greatly enhanced the knife's cutting efficiency in this medium. My knuckles were somewhat exposed to the foliage, but I don't know of any other knives that would have offered any additional protection here. Towards the end of this drill, as I made a last whack at a particularly stubborn branch, the blade passed through more far more easily than expected and went on to impact a granite rock at nearly full force. I immediately recited a few choice words that are appropriate only on the Whine and Cheese forum. When I inspected the edge, however, I was thrilled at the minimal amount of damage that had occured. I had dinged the edge pretty good down near the handle to be sure, but it felt to my thumbnail as if the metal had rolled and deformed rather than chip out. The affected area was maybe 4mm long by 1mm deep. Other than that, the remainder of the edge still felt as sharp as when I had left camp. Once dinner was secured in the form of several rainbow, german brown and brook trout (the largest measuring about 16 inches) we departed the area. After hiking back to camp (and waiting for my heart rate to settle back down into the low 200s), the Busse was immediately put to work preparing wood for the campfire, breaking down an old pallet that we had found in a nearby clearing, and lopping the heads off of our trout. At the end of all the day's activities I could now honestly say that, though still very sharp and functional, the edge had lost a little of the toothy feel it possessed when new. I will now interject a quick plug for the diamond sharpening tool sold by Mission Knife and Tool. Though intended for use with their line of Beta Ti knives (and specifically designed to preserve the non-magnetic properties of the ti knives), these little sharpeners are lightweight, durable and are outstanding performers on any blade. Of course, sharpening steel blades with it can contaminate your ti blades, but this is of no concern to me. After about five passes of the hone on each side of the SHII, the blade was like new again. Even the INFI that was displaced by the rock impact was neatly realigned and almost undetectable after a few more passes in that specific area. In short, I couldn't have been more pleased with the blade's performance throughout the day on this wide variety of heavy duty tasks. But what may have impressed even more about the SHII, was the ease with which it handled the delicate cutting chores. All weekend long while fishing, the SHII neatly trimmed away the excess Spiderwire (you know, the braided fishing line that's impervious to teeth and nail clippers) from the knots used to tie on my hooks and flies. Opening small foil pouches was an easy task as well. It was here that I noticed how the assymetrical edge geometry of the Busse knives will cause the cut to drift. You quickly realize, however, that by holding the blade at slight angle, you can once again achieve straight cuts easily. The bottom line is that I am thoroughly satisfied with both the versatility and durability of my Steel Heart II variant. Over that 48 hour period I used it more vigorously than any knife I've owned and yet I feel like I never even approached its potential. INFI steel is definitely a performer. Although I should know better, I can't believe how resilient this steel really is. For any of my other knives, the rock impact alone would have resulted in an extended session on the Edge Pro. I still feel like there's some room for improvement where the sheaths are concerned, especially in light of the work that Tim Wegner and others are putting out, but this is a relatively minor beef. Overall, my hat is off to Jerry for producing such a nuclear tough product, and my thanks go out to Andy Prisco for providing a level of customer service that's befitting such an outstanding product. Thumbs up What my Battle Mistress can do! I have a fairly large tree in my front yard which was in dire need of trimming for the winter. I decided to forget a chainsaw or pruning blade and use my BM for the job. The branches I trimmed ranged from 3-4 inch thick to small twigs. I spent 1 1/2 hours wacking away on the tree. The smaller branches fell in one swipe. Sometimes the blade whistled through so easily that I almost lost my balance! The larger branches of course took a few more chops but large chips of wood were flying with every swing. With each swing the blade bit deeply into the wood. I am simply amazed at how the edge held up through this torture test. It shows absolutely no sign of any use. The blade still shaves the same as before I started. The coating shows virtually no signs of scuffing. I would swing the knife into the limb and then torque it a little to help break it out. It really does act like a sharp pry bar. The blade has a very rigid feel to it while working. Even though it would flex slightly when I was really twisting on it. The handle was comfortable as far as not feeling much vibration. The little "parrot's beak" at the end of the handle did tend to rub my pinkie a little, but it absolutely helped me to lock my grip in on the knife while chopping. After 1 1/2 hours of hard work, it did little more than work a very small callous near the outside of my pinkie near the middle joint. I felt no hand fatigue while using this knife. I would liken the correct way to swing this blade to the same way you should use a hammer - let the tool do the work. When I let my hand and arm relax and just let the blade fall smoothly onto the wood, it felt smooth as butter! Well, I know that Cliff Stamp and Mike T. are going to be putting the Busse production knives to the test here soon. I am here to tell you that I had more fun using this tool than I can remember with a knife. I have absolute faith that this knife would outlast me before I could use it enough at one clip to dull it or damage it. I literally used it nonstop for 1 1/2 hours and it is still unfazed. I, on the other hand, need a shower and some clean clothes. I have no doubts that the testing of these blades will substantiate my belief that this INFI steel stuff and Busse's method of manufacture is the future of knife making. I can hardly wait for more people to obtain a Busse knife so that they can see for themselves what us lucky few BM owners already know. I stand humbly before my Batle Mistress a worn out individual. This knife is defintely a keeper. I plan to put it through more tests on upcoming camping trips. 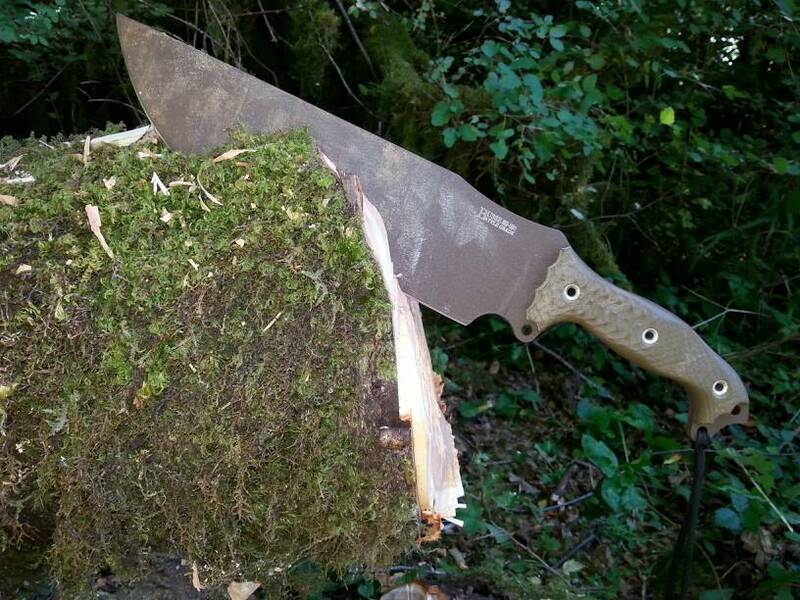 Did you chop down that tree with your knife? If so, truly amazing! Firestrike... that's pure beast mode! Well done! The tree was freshly down and protruding into one of my favorite camp sites. It was a bit of work, but the knife was very ergonomic and super comfortable to use.